Sublime scenery (here in the Bahamas) and only three cats in the anchorage: a certain idea of paradise on earth (or on the sea)? Fishing – when long-term cruising or chartering – always remains one of the big moments… Equip yourself accordingly! Aboard a cat – or a trimaran, like here on the Neel 51 – the space is huge and allows 10 to 12 people to be accommodated comfortably! Owning a multihull, sailing when you want to, setting off for the enchanting lagoons for one or several sabbatical years…we all dream of this! But… it’s not always possible, for reasons of budget and/or timetable. The solution? Charter, of course! 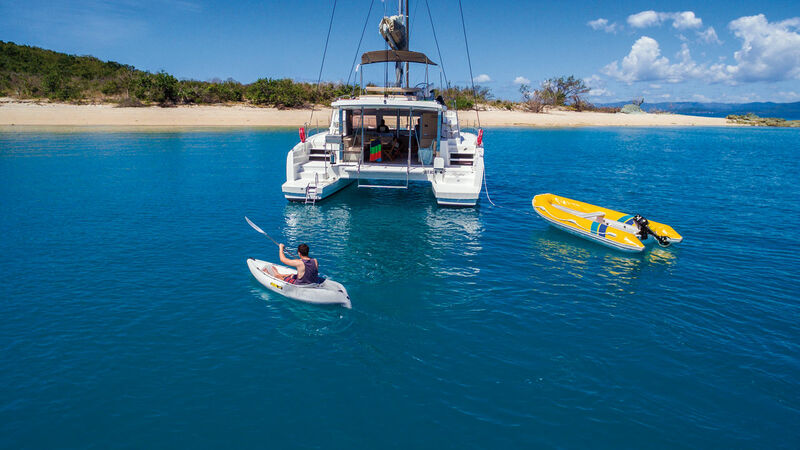 Those who like cruising on more than one hull – and this is also true for those who are still fond of monohulls - often take quite some time to take the step and decide to charter a multihull. Why? In the collective imagination, chartering a sailboat is expensive. Indeed, treating the family to a week’s charter in the Bahamas, in the high season (March/April), including air tickets, is not within reach of everyone’s pocket. But by opting for a closer destination, off season, a bigger boat so it can be filled with two families, or again by paying attention to certain charter companies’ special offers, there is a way to find a charter which corresponds to your budget. And even to find last-minute charter weeks at slashed prices, thanks to the internet, where numerous offers are to be found. The boat charter market has for a long time been dominated by the big players, such as Sunsail/ The Moorings, Dream Yacht Charter, Kiriacoulis, etc. The strength of these professionals: the setting up of physical bases, with sometimes more than 30 boats per site. Sites run by professionals – reception, maintenance, skippers. Their second advantage: a charter/management offer for the owners and therefore new boats, or ones in very good condition, for the charter customers. Other more local structures have also succeeded in making a place for themselves in the sun - family companies (often), on a human scale, where service is the keyword and each customer feels a little as if they are 'at home'! And then gradually certain agencies have been created to offer traditional charter customers all the offers together on the same platform. At first, a catalogue, then today on the internet. Certain of these agencies, created over 20 years ago, today reference more than 18,000 boats in over 80 countries!